-Fully Automatic, Microprocessor controlled, straight line liquid filling machine. Handles glass, plastic or metal containers. Handles all free flowing liquids (excellent with foaming and slightly viscous products). In stock and available for fast delivery. The Model FA-P Pressure Filler comes equipped with the following standard features at no charge. All liquid filling applications. Excellent with thin to slightly viscous foaming products. The fillers offer accuracy, repeatability and ease of use with little or no changeover parts State-of-the-art components offer maximum performance, reliability and versatility to keep pace with your production requirements. 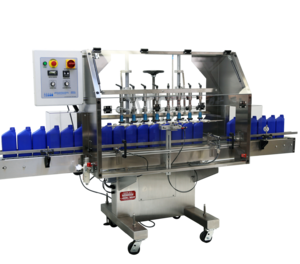 FILLS-ALL fillers can operate separately or can be integrated into a complete packaging system. - Air: 1-2 cu/ft per min. 90psi.